Your water heater is responsible for producing the hot water for your showers, washing machine, dishwasher, etc. It runs in the background and most homeowners don't think twice about their water heater until it stops working. 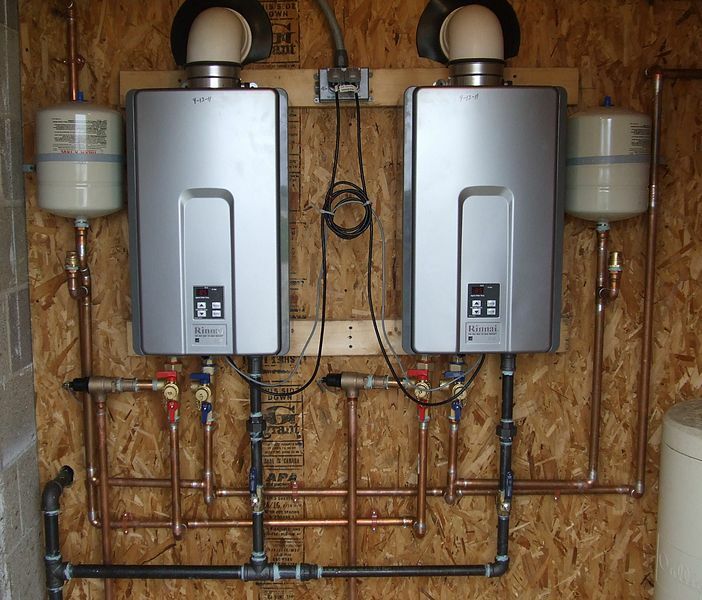 If you find yourself in the position of having to replace your water heater (or simply want to upgrade), then let us tell you about Tankless Water Heaters. Here are some things you should know about how to choose a tankless water heater. Basically, a tankless water heater does not use a storage tank because it does not store water. It heats the water directly as it's being requested. So, you turn on the hot water tap in your sink, water (which is cold) runs through a pipe in the water heater unit and it's heated either by a gas or electric element. Giving you hot water. One of the most touted benefits of a tankless water heater is that since the water is heated as needed (instead of being stored) there's a constant supply of hot water. No chance of the hot water running out in the middle of your shower. With a tankless unit you can fill up that large jacuzzi tub in your bathroom with no worries about running out of hot water for your dishwasher. Tankless units can save you money in the long run. The U.S. Department of Energy has estimated that tankless units can be 24% - 34% more energy efficient in homes that use 41 gallons or less of hot water daily. Tankless units run at 90% - 98% efficiency. The standard water heater holds about 40 - 80 gallons of water and it keeps that water heated, waiting for you to use it. There's a good amount of wasted energy in this type of system. If you need to maximize the space in your home, a tankless unit will certainly take up much less space than a conventional water heater. Tankless units are available as whole house units or small, point-of-use units for individual areas such as a sink or shower, etc. The lifespan of tankless units are almost double of a traditional water heater (20 plus years). So, although the initial cost of a tankless unit is more - if you plan to stay in your home for the next 20 plus years, this type of water heater could save you money and time, when properly maintained. What Are The Cons Of A Tankless Water Heater? Before you choose a tankless water heater for your home, you should know the benefits of course but you should also know the cons. Because hot water is delivered directly on an as needed basis - the unit cannot produce hot water for multiple units at once. So, taking a hot shower AND running the washing machine may only give you lukewarm water. To avoid this you must purchase the proper size unit for your needs. The initial cost is higher than traditional water heaters. If you are switching from a traditional water heater to the tankless unit, there is a cost for retrofitting and installing the unit. As we stated earlier, there are Whole House water heaters and there are smaller point-of-use units that can be installed for specific areas such as sinks or appliances such as dishwashers, etc. At Atlantis Plumbing we install Whole House tankless units. There are also gas and electric water heaters. Generally, gas water heaters work faster at heating the water. Know that gas tankless units still require electricity to run. There are indoor and outdoor tankless units. Which one would be best suited for you depends on the venting situation in your home. Even though the lifespan of tankless units are much longer than their traditional cousins, it's still important to make sure that you purchase a unit that offers a long term warranty. The most critical component of these units is the heat exchanger so check that the manufacturer's warranty covers that for 5 - 15 years if possible. Tankless units are NOT plug-n-play. They require professional installations. It may take a few seconds longer for you to feel the hot water from a tankless unit. Recerts are available for all units. The amount of space you have to mount your unit. The climate you live in. Gas tankless heaters work better than electric in cold climates. Here in Atlanta, Ga we do sometimes get very cold weather but we are fortunate that it does not last long so either an electric or gas tankless unit will work very well in our region. Know that a 2.6 GPM (gallons per minute) model can heat 1 shower at a time. A 4.0 GPM model can heat 1 shower and 1 sink at a time. A 6.0 GPM model can handle heating 2 showers at a time. Most units are 9.7 - 10 GPM. In summary - tankless units are a wonderful replacement for your water heater. You can save money in the long run so if you plan to stay in your home for 20 plus years, then this option will pay for itself. Because tankless units heat the water on demand, there's no excess energy spent on heating water that's waiting for you to use it making it energy efficient. If you're interested in a tankless water heater or have any questions about them, call Atlantis Plumbing today at 770-505-8570.